On a Saturday night more than seven years ago Chorley welterweight boxer Michael Jennings made history by becoming the first Lancastrian in a generation to fight for a world title. In his corner that night was Damian Hughes, author, sports psychologist and son of Brian Hughes, the renowned trainer who helped Jennings to the brink of sporting immortality. Here in an excerpt from his latest book “The Five Steps to a Winning Mentality, Damian recalls that memorable night in New York. There’s an old boxing maxim – a fight is never won on the walk to the ring but it can be lost. Many fighters lose their nerve on the long walk to the ring – think dry-mouthed Frank Bruno repeatedly made the sign of the cross on his second walk to face Mike Tyson in 1996. The months of preparation can be undone in these crucial few minutes. I was thinking of this adage whilst I sat in the dressing room watching Chorley’s Michael Jennings prepare for the biggest night of his boxing life in February 2009. He had chosen to step into boxing’s equivalent of the Roman amphitheatre, New York’s Madison Square Garden to face the fight game’s equivalent of a ravenous lion, the unbeaten Puerto Rico world champion Miguel Cotto, a ferociously powerful fighter on his way to future Hall of Fame status. Jennings was a huge underdog but like all fighting men, he couldn’t resist the opportunity to take his shot at glory. As the minutes tick slowly towards the designated fighting time, the real value of a great coach is role to ensure that nerves don’t hijack the carefully crafted plans honed in the gym. Jenning’s long-time coach Brian Hughes, a man I am proud to call dad, had been learning his craft as master coach since he was a boy and these insights always came packed with common sense hewn from years of experience. “Listening to his wisdom, presented with a mix of gruffness and enthusiasm delivered in the kind of accent and phraseology that seems to have stepped straight from the pages of an Alan Bennett script, is one of life’s pleasures,” was how the Daily Telegraph once described his instruction. One of the final acts in the dressing room is the bandaging of the fighter’s hands. It is an intimate process which needs to be done slowly and with real care and attention. It is also an intensely private moment for both coach and boxer to talk in quiet whispers. When titles - and big money - are at stake, it is necessary for a member of the opposition fighter’s team to oversee the exercise and ensure that nothing untoward - horseshoes or cartoon anvils for example - is being secreted. It is also viewed by some as an opportunity to gain a late advantage by attempting to disrupt the fighter’s concentration. Miguel Cotto’s representative took his chance to ensure that the butterflies flying in Jenning’s stomach were sent scattering. When the wrapping was finished, he stated his dissatisfaction with the process and insisted that it was repeated. He maintained his unhappiness after the second attempt was concluded. On the third occasion when he threatened to cancel the fight unless it was repeated, Brian Hughes noted a slight, barely perceptible shake in Jenning’s hands. The tactic, designed to rattle his nerves had started to work. Angelo Dundee, Muhammad Ali’s legendary coach, once told me that the difference between a good and a great coach is to know when to intervene at those ‘U-ho moments’. He referenced his famous tearing of Ali’s gloves after Henry Cooper had knocked him down, to buy valuable recovery time. Brian Hughes was a great coach and he recognised the moment. He turned, slowly and deliberately, to face the loud, braying Puerto Rican, and then pounced with a speed that defied his 69 years of age. The ensuing fracas, with New York boxing officials quickly jumping in to intervene and stop events spiralling out of control, created a sufficient distraction. Cotto’s trainer was escorted out of the room and his distracting request was quickly forgotten. Hughes turned and winked at Jennings. ‘We won’t let anyone bully us tonight, Mike’ he said. Jennings smiled and nodded his understanding. Sitting casually on a plastic chair with his feet perched on the edge of the boxing ring which dominates his gym in Coppull – a small village close on the outskirts of Chorley – a wry smile slowly creeps across the face of Michael Jennings. The former British welterweight champion and world title challenger is flicking through the latest book written by professor and sports psychologist Damian Hughes. Five Steps To A Winning Mindset is a study of the best ways to create a winning mindset in both personal and professional life. As the son of Jennings’ former trainer Brian – widely regarded as the ‘godfather of Manchester boxing’ until his retirement in 2011 – Hughes has acquired a huge swathe of knowledge and experiences in the world of sport, and particularly boxing, which he has used to illuminate the book. There is one passage which is devoted to the biggest night of Jennings’ career when he fought the legendary figure of Puerta Rico’s Miguel Cotto for the WBO world title at New York’s Madison Square Gardens, in 2009. The excerpt – which is reproduced in its entirety on the opposite page – relates to an incident shortly before the start of the bout when a member of Cotto’s team tried to intimidate the Chorley fighter, while his hand were being taped. Brian Hughes – who was the man doing the wrapping – was having none of it as stood his fighter’s corner, sending the Puerta Rican’s representative packing. Jennings – who was a huge underdog for the fight – subsequently went on to produce a sterling performance before eventually succumbing to Cotto after five brutal rounds. “He’s a good lad is Damian,” said Jennings, who is now himself building a career as a trainer since injury forced him to hang up his gloves in 2010. “It’s funny actually – we’ve got the Chorley football team coming into the gym tonight. “We will be training them but also giving them a little talk – and that will be all about having the winning mentality. “But I remember this incident in New York well. At the time, I remember thinking, ‘What the hell is going on here!’ I just wanted to get ready because I was one of those fighters who liked things to be all planned out. I liked to follow a plan. “By the time it got to the third time of Brian being asked to re-wrap my hands, I was thinking, ‘You have got to be joking’. “Brian by this time – he was absolutely fuming. He then suddenly just lost his temper – BOOM! “He pounced up at this guy. “They were both around about a similar age – they were both getting on a bit – but you should have seen them both...they were stood toe-to-toe right in each other’s faces. “It ended with Brian getting the Puerta Rican thrown out of the room. “Don’t get me wrong, that split second in time, it got to me a little bit. “But straight afterwards I was okay and I got myself back focused on the fight. “What helped me was not the fact that Brian had squared up to him, but when he turned to me and gave me a wink. “He kind of made a joke of it and that definitely helped me. “Brian was good at that. He knew that Cotto’s guy was trying to unsettle me and there was no doubt about it, I was unsettled. “But by giving me that wink and saying, ‘Nobody’s going to bully us tonight’, it reassured me and it was a case of, ‘Let’s get back to business’. “That was Brian though – he was a master of getting his point across and explaining stuff to you so you understood it. “I think Brian was one of only a few people who actually believed in me that night and believed that I could have won. “And if he didn’t believe in me that night, then he was a bloody good actor. “To be fair there were quite a few things which happened while I was in New York,” Jennings said. “The night before the fight, all the fire alarms went off in my hotel at half three in the morning. I didn’t get out of bed though. There could have been a blazing fire. I just went back to sleep. “There were loads of little things like that, little ploys, to try to unsettle me. “But experiences like that are great for me to pass on to my fighters. Apart from all of the events which took place outside of the ring, Jennings looks back with pride on his performance against Cotto, although his overriding feeling is one of disappointment. “Everybody was saying beforehand that I had no chance. Nobody, apart from the people close around me, gave me an inch of a hope,” he said. “I did not care what anybody thought. “I was going over there to win, so my main thought from that day is one of disappointment. “I was gutted to lose – it did not matter that I was up against one of the best pound for pound fighters in the world. “Cotto is a Hall of Famer – one of the greatest. He’s still going now and the better fighter won on the night, but it doesn’t stop me from feeling disappointed. 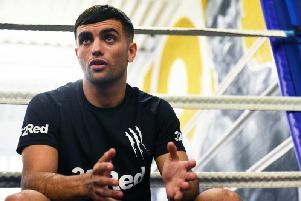 With Preston’s Commonwealth Games gold medal winner Scott Fitzgerald and Blackpool’s Matty Askin among a growing list of fighters utilising his skills, Jennings admits the knowldge and experience he gained from Hughes will not be far from his thinking. “There’s been a few times since I’ve been a trainer when I’ve wanted to ring Brian and ask him what he would have done in certain situations,” said Jennings (38). “But I’ll always remember Brian asking me to go down to somewhere like Oxford University I think it was to do a talk with him. “I asked him if I needed to write a speech, but he just said, ‘No, just let it all come out’. “He did his talk, then turned to me and said, ‘Right, this is Michael Jennings’. “I was like wooooaaah. I hadn’t gone prepared but luckily I’m a good talker and I just talked about who I was and where I had come from. “I tried to turn my upbringing into a positive because we were dragged up.There were 10 of us – eight kids and my mum and dad in a three bedroom house. “I talked about one of my brothers being a heroin addict, who died of an overdose. Damian’s latest book, Five Steps To A Winning Mindset, a guide to how the tactics used by great coaches can be used in all walks of life, is released by Macmillan next Thursday, July 14, and is priced at £12.99.